Tampa Bay’s flounder fishery has been dramatically improving over the past few years. Fortunately for those of us that like to catch and eat these tasty flat fish, flounder populations are strong enough to exclusively target them during the cooler months of the year. The weather is not the only thing that is hot right now. The summer heat is here but with it comes some of the best fishing action of the year. 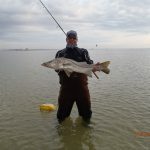 Fishing the flats and mangrove shorelines for snook, redfish, and trout is still consistent, but the best action has been for tarpon, cobia, sharks, snapper, and grouper. 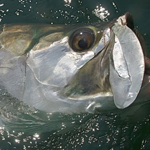 Tarpon Season 2014 is upon us! TARPON SEASON IS HERE!! 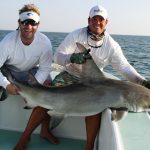 !Tarpon fishing in Tampa Bay is perhaps the most exciting light tackle fishing the world has to offer in one of the worlds most productive tarpon fisheries. 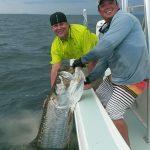 This season is sure to be a great one and I still have a few good tarpon days available for May and June. Our recent fishing charters on Tampa Bay have been fair to excellent over the last month and things are really about to heat up. 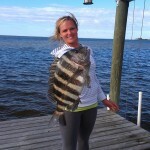 We have been fishing from the Skyway Bridge and Fort DeSoto all the way up in the bay to the Gandy Bridge. 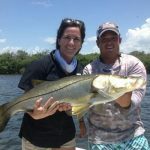 The redfish and trout fishing have been good, but it’s the snook action that has really stolen the stage lately. We have caught many snook over 30 inches lately, and lost some even bigger ones to the bushes and docks. 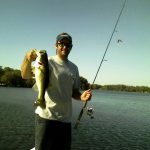 The Fall weather is here and with it brings some of the best fishing of the year. Almost every part of the bay is holding good numbers of gamefish and the near shore and offshore fishing is red hot as well. 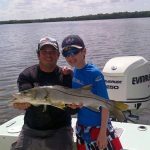 Inshore fishing for Snook, Redfish, and Trout has been excellent and a Florida Inshore Grand Slam which consists of one of each of the above mentioned species is almost a guarantee, even on a half day of fishing. 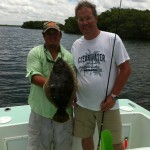 Fishing around the cold fronts is the key to making a great day! The fishing out of the Gandy area has been on fire! Trout in the 17-24 inch class and multiple slot redfish being released as well as those over 27 inches. The smaller redfish are also easy pickings with a 1/8th oz jig and a piece of shrimp slowly moved along the channel edges and drop offs! Shallow water redfish might be my passion, but largemouth bass fishing during the spawn and pre-spawn months has been a tradition for me since i was a kid. I loaded up the Hewes Redfisher with a different type of tackle this day. Topwater frogs, weedless worms, and texas rigs filled the tackle storage and off to a local lake we went.